Nohely is the friendly voice behind the phone when you first call to schedule an appointment. She is always waiting to greet you with a smile and assist with any administrative needs. She is also bilingual and happy to facilitate for all of our Spanish speaking patients. Call and say “hello” today! Carly is a Registered Dental Hygienist and has been a part of the Brunswick Dental Care team since 2007. She is responsible for cleaning your teeth, examining your mouth and assisting in the management of your preventative oral health care plan. Carly takes great care in providing you with a relaxed yet thorough appointment. Jennifer has been a dynamic part of our team since 2016. She is a skilled assistant, adept at making patients feel at ease. 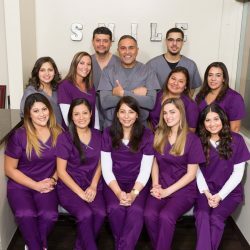 Additionally, she is fluent in Spanish and happy to assist with Spanish speaking patients. Her gentle and friendly mannerism is always apparent. Jen is very bright and is currently enrolled in a doctoral program. Katia is a Dental Assistant and has been a part of the Brunswick Dental Care team since 2016. She is fluent in Spanish and is here to provide you with the utmost attention and care while assisting Dr. Ibrahim or Dr. Wadie in any necessary procedures. She is a warm and welcoming presence throughout your visit, always making patients feel like old friends. Daisy joined our team in 2017 and is here to provide you with the utmost attention and care while scheduling your next appointment or managing your account. She is always ready to welcome you and answer any questions you may have. Helen joined our team in 2017 and is a gentle and friendly face for all of our patients. She is here to provide you with the utmost attention and care while assisting Dr. Ibrahim, Dr. Awad or Dr. Wadie in any necessary procedures. Alexandra recently joined Brunswick Dental Care and has quickly become an avid part of our team. She is here to provide you with the utmost attention and care while assisting Dr. Ibrahim, Dr. Awad, or Dr. Wadie in any necessary procedures. Germaine has enjoyed being a longtime member of the Brunswick Dental Care team. She manages our online presence via the website and Facebook pages, community service involvement, marketing, and patient satisfaction.